Just as layered clothing can be difficult to pull off – finding the perfect blend of complementary colors, styles, and textures – the layered window treatment requires special design expertise. Not just any blind, shade, or shutter can work with another. Still, it’s well worth the effort it takes to create a layered look, as multiple window treatment combinations can increase the beauty and functionality of a window. Here are a few combinations to consider for a beautifully layered window. 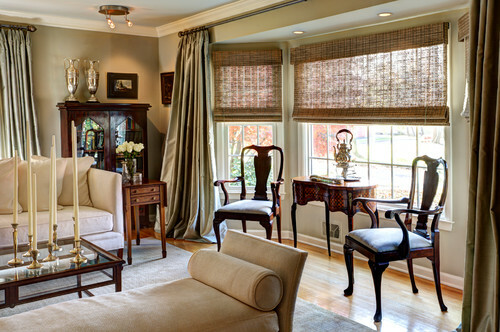 Blinds and Draperies: Blinds and draperies are a classic combination for a wide range of light and insulation control. While blinds allow for energy efficiency and savings regardless of the season, draperies can add increased light control and insulation with blackout, thermal fabrics. Neutral colors allow for an easygoing, fresh layered window treatment look. White blinds allow patterned draperies to steal the show. Cafe Shutters and Draperies: While cafe shutters with draperies may sound like a lot to put together, white cafe shutters effortlessly match white windows and allow for a wide range of privacy control. When evening comes, though, draperies provide extra privacy and light control. They also increase insulation more than shutters alone. 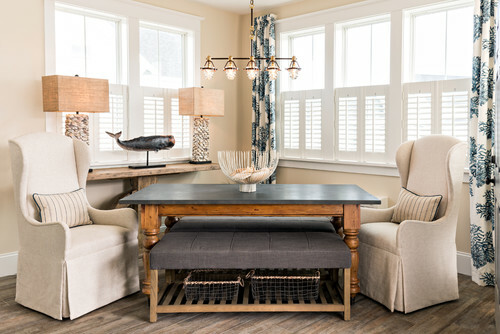 This is a beautiful selection for a more traditional home with neutral draperies or a transitional-style beach house with coral-printed draperies. Draperies can also beautifully frame a window nook. Sheers and draperies are another no-fail combination for layered windows. While sheers allow for light to flood in on beautiful, sunny days, draperies allow for increased insulation and privacy when needed. Neutral sheers in white and off-white colors layer well, without taking the spotlight away from detailed draperies. Of course, you can’t go wrong with two neutrals in an already colorful room, like this traditional bedroom with a gorgeous, intricate rug. This combination is all about balance — thick, lush draperies are lightened up with thin, linen and neutral-colored roller shades. This look is ideal for home designers who want the best of both worlds – luxury and lightness. Natural wood or bamboo shades add texture and contrast to silken, flowing draperies. Of course, you can’t go wrong with the traditional combination: a valance at the top of the window, with draperies and curtains flowing underneath. This look is a favorite for children’s bedrooms and nurseries, as well as traditional spaces like dining rooms and master bedrooms. Valances and shades are an ideal combination for a touch of sophistication combined with practical and efficient window coverings. For this reason, they’re a great choice for spaces like the kitchen and living room. For an intriguing mix of textures, consider combining smooth, soft valances with textured, natural roller shades. While the art of layered window treatments allows for a number of combinations, proper execution of these looks requires great attention to detail, design prowess, and expert installation. For perfectly layered window coverings like the ones you see in shelter magazines, the first step is to consult with experts. 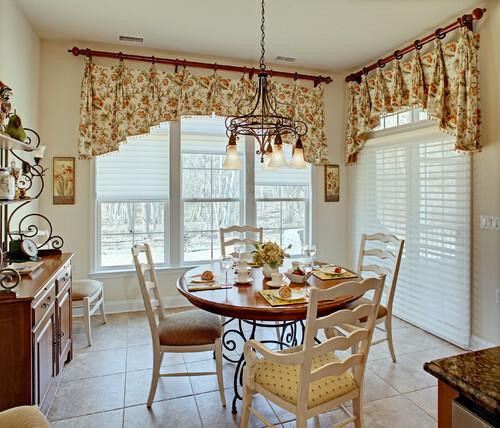 To get started on your next window treatment project, contact us at Strickland’s Blinds, Shades & Shutters.